For well over a decade the National Labor Relations Board has freely invalidated seemingly neutral, common-sense workplace rules simply because employees might understand them to limit their rights under federal labor law. Rules were held unlawful even if they were neither intended to limit employee rights nor ever applied in a way that actually interfered with those rights. However, a recent decision by a newly constituted, Republican-majority board adopts a new analysis for determining if workplace rules are lawful.1 The new test will be applied to future cases as well as all pending cases. Practically speaking, this is one of the most significant and employer-friendly legal decisions of 2017 in the labor and employment law arena. Abatement Ab Initio: Old Wine in New Casing or Old Wine With a New Kick? Aaron Hernandez – the convicted former New England Patriots football star – recently committed suicide; his death has resurrected interest in a little known but important legal concept in American criminal law and procedure: abatement ab initio.1 The doctrine of abatement ab initio applies when a convicted defendant, like Hernandez, dies before his appeal rights are fully exhausted. When applicable, the doctrine wipes clean the defendant’s slate, as though the indictment, conviction and punishment never happened.2 For example, if as a result of a conviction, a criminal fine had been levied but not collected, abatement ab initio makes the obligation to pay go away.3 The converse, however, is not true. When a defendant dies before exhausting his appeal rights but after having already paid costs, fines and restitution as a result of his conviction, despite the conviction being wiped clean, the deceased’s estate has no right to recoup the money previously paid.4 Until now. 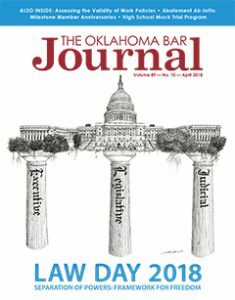 The Oklahoma Bar Association applauds these members who, in 2018, reach significant milestone anniversaries.